A few days ago, I came across a tweet from Nic Rivers, who is part of the truth-challenged Stewart Elgie‘s enviro-activist shop, Sustainable Prosperity (SP). His research involves the evaluation and analysis of environmental and energy policies, and is conducted using a variety of methods, including simulation models and econometric analysis. 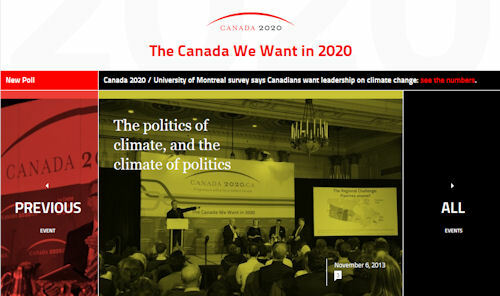 Enjoyed the @Canada2020 event on the politics of climate policy this evening. 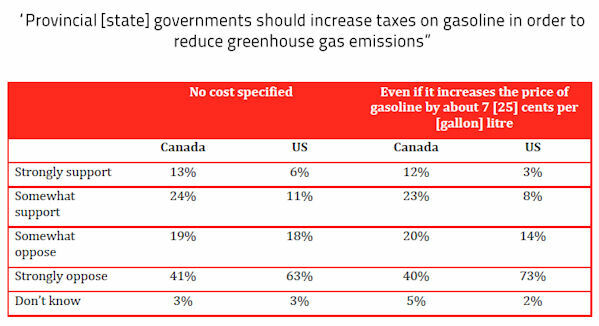 Polling results suggest Canadians willing to pay for policy. Wow! Look at that banner slogan, folks! “The Canada We Want in 2020“. Strikes me that it has more than a faint echo of the United Nations Environment Program (UNEP)’s Rio+20’s outcome document‘s The Future We Want slogan. Notwithstanding Rivers’ omission of any link to the actual results of this poll, it wasn’t too difficult to find on the Canada2020 site. The link can be found on their “Interactive Survey Results” page. This “interactive survey”, btw, seems to be modelled on and/or using software that is a variant of that which underlies the survey being conducted by the UN (where the results still indicate that “Action taken on climate change” remains at the bottom of the world’s priority heap). For the record, as of 11/8/2013 08:01 PM PST, I have seen no response to my questions. In the interim, though, following the link from their “Interactive Survey Results” page [“Download complete results: US/Canada Crosstabs | Weighted Data” (backup here)]. Also, for the record, in their latest version, in addition to replacing “… increase greenhouse gas emissions” with “… reduce greenhouse gas emissions”, they’ve added page numbers, so that which originally appeared to me as being on p. 8 (as noted on my tweet) now appears on page 7! Oh, and they seem to have spotted the missing month in their original intro to the US survey. Stretched out, I suppose there is a certain “bracketed” symmetry to this heading. But here’s the thing, folks! On all their “cross-tab” questions and results, they show – in a consistent order – “Provincial [state] …” and “Canada US”. So why confuse the reader by reversing the order of the heading text? Why not continue to follow the pattern they’ve established and express this as, “… about 7  cents per litre [gallon]”? Although, IMHO, what would be preferable would be to express this as “… about 7 cents per litre [25 cents per gallon]”. OK, OK … I agree that this is somewhat nit-picky, on my part. And who knows, maybe they do things differently at “progressive think-tanks”. 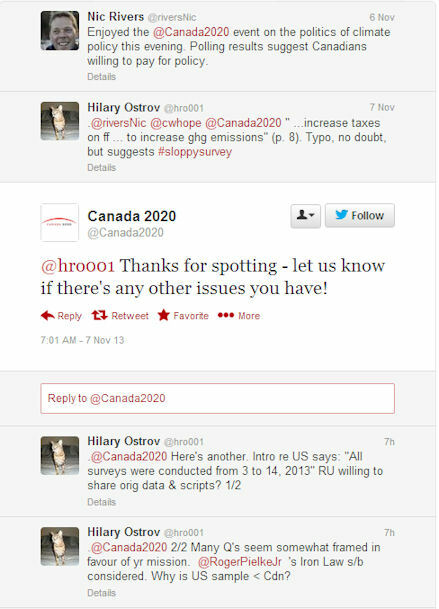 But, if we can’t trust Canada2020 to pay attention to the small details (the first time around! ), why should we trust them on their Big Pictures, eh?! 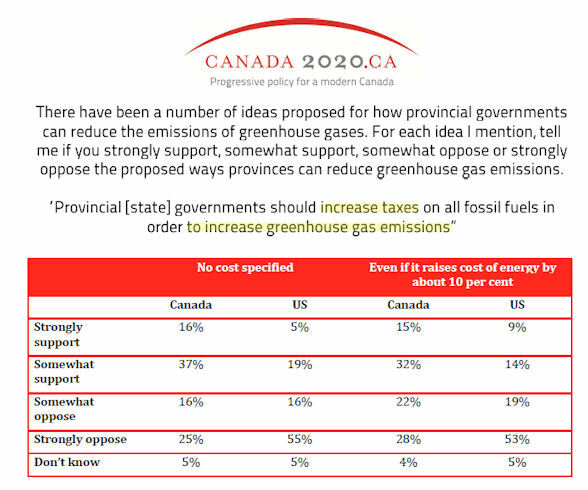 Which brings me to the statistics and methodology underlying this Canada2020 poll/survey. As noted above, I have received no response to my (now translated from twitterese): “Are you willing to share your original data and polling scripts”? Maybe they’re thinking about it (or perhaps not!) But if they do decide to subject their data and methodology to scrutiny, you can rest assured that such scrutiny is not a task I would undertake! I am probably one of the most statistically-challenged people I know, and I have been quite open about this, both on this blog and in comments I’ve made throughout the blogosphere. So I would turn to those I know who have the requisite expertise. Steve McIntyre is the first name that comes to mind, as he does on occasion take on the stats and methodology underlying papers that are peripheral or tangential to pure climate related stuff! Or I might turn to Andrew Montford (aka Bishop Hill), author of The Hockey Stick Illusion. Or perhaps to economist, Richard Tol – or to William M. Briggs (aka @mattstat). A meteorologist bites back against the high-jacking and degradation of the field. Meanwhile, the official society has been reduced to Pavlovian barking whenever the climatology paymasters tinkle the bell.